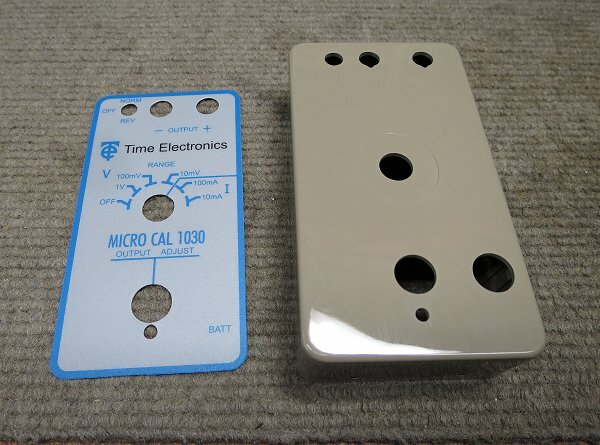 Having recently built a simple DVM reference, I've been investigating similar products and noticed the 1030 Micro Cal from Time Electronics, a long-established UK company specialising in precision electronics. 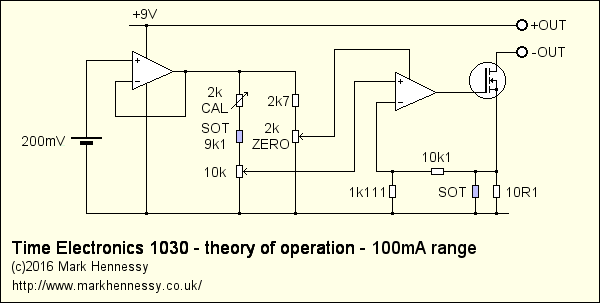 The 1030 is a compact precision voltage and current source. It has 5 ranges: 1V, 0.1V, 10mV, 100mA and 10mA. A ten-turn potentiometer allows you to dial up any voltage or current you like within each range with up to 0.1% accuracy. 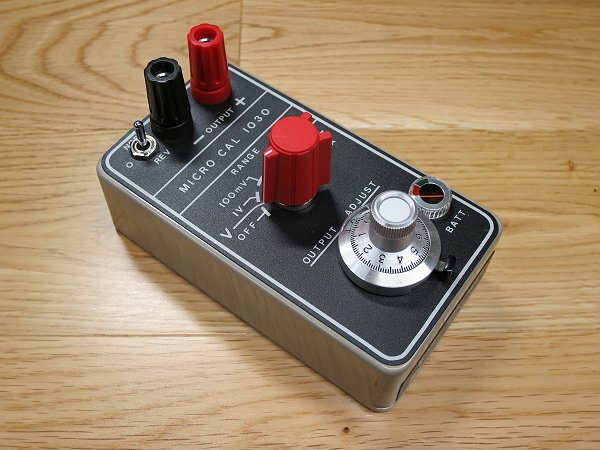 A toggle switch allows you to flip the polarity (or turn the output off). It is powered by a single PP3, and there is a tiny moving-coil battery meter to show its condition. 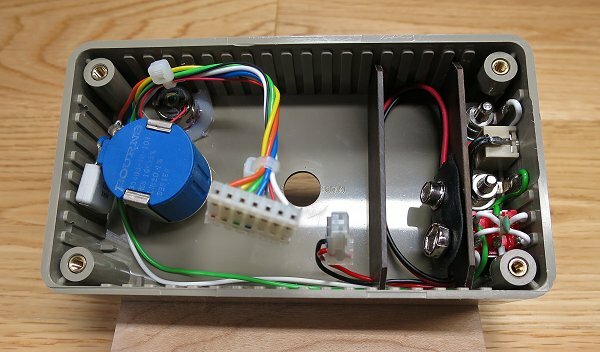 Also, a DC input socket is provided, allowing you to either charge a NiCad battery if you install one of these instead of a regular PP3, or power the unit from an external supply instead of the battery. I spent some time testing the units with my Keithley 2015THD, and the good one still comfortably meets the specification (the other didn't quite, as detailed later). Like all top-class test gear, the spec appears to be pretty conservative. A few points about that toggle switch by the output terminals. 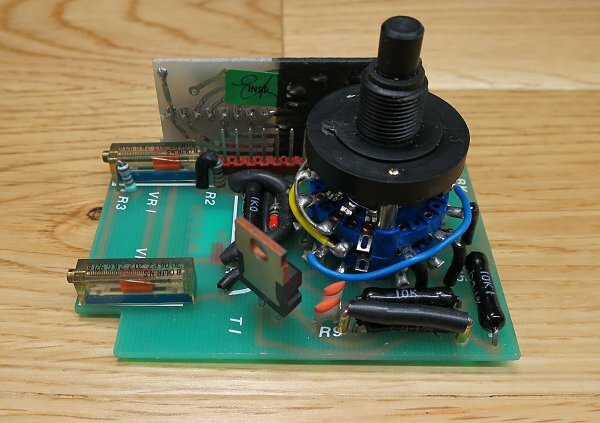 First, I wish I'd thought of this when I was building my LM4040 DVM reference, and it's an idea I'll definitely "borrow" for similar projects in future! Now, at first glance, it looks like a standard toggle switch with a centre-off position - and given that, I assumed that when off, the output would be floating. With a high-impedance meter, this will cause random readings as charge accumulates - and this can indeed be observed when the unit is switched off using the rotary switch. However, a quick measurement shows that when the toggle switch is in the centre position, the output is indeed shorted. The manual does say this in the specifications, but I missed it initially. This means they must have ordered a special ON-ON-ON version of the toggle switch - one that might not be easy to find should you need a replacement today. Either way, it's important to familiarise yourself with this point, as there might be implications on the application you're using it. As always, know your gear! These readings were taken with a 9.00V supply voltage and with the variable control set to maximum. The meter suggests that the battery is exhausted at approximately 7.8V. However, in voltage mode, the unit continues to supply the correct output voltage to comfortably below 5V. Though I'd change the battery as soon as indicated, as they seem to be much more likely to leak when exhausted. According to the older printed copies of the manual, the battery meter has an FSD of 1mA, which is a significant proportion of the total current when in voltage mode. But I don't know what else could have been used back when the design was done - today you might consider using modern high-efficiency LEDs (the battery-low circuit used on my DVM reference takes around 150µA). To change the battery, undo 4 screws and remove the bottom panel. It's a bit of a squeeze in there! 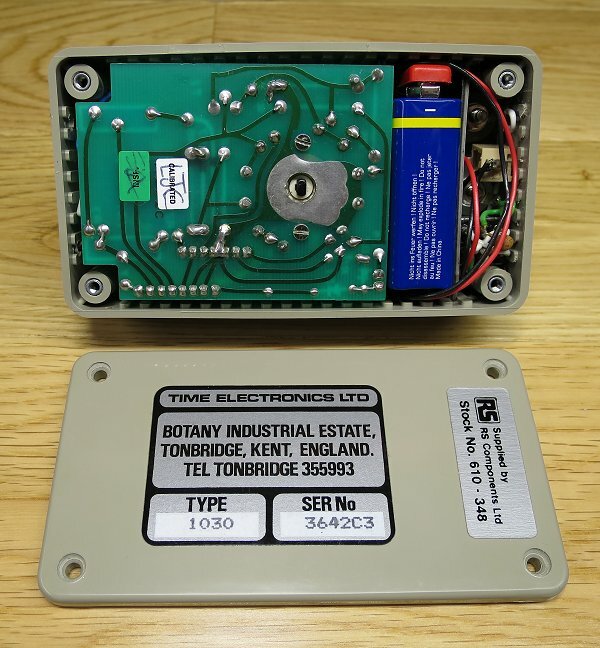 The enclosure is a standard plastic box with PCB slots - these are used to retain 2 pieces of plastic either side of the battery (the left one is just hidden by the PCB in this picture). The box measures 113mm by 62mm by 32mm approximately. The PCB artwork was clearly hand-taped - I'm not sure how old the design is, but this example appears to date from the early 1990s. Note the star-earth point about an inch to the left of the lower screw. Note the high quality Bournes potentiometer - you can bet that this is the single most expensive component in the whole unit. It's a 3540S that has a linearity specification of 0.1% printed on the back (standard offerings are 0.25% - still very respectable). It has a date code of 9212. In this picture you can see two holes in the end of the case. These are covered by a sticker (bearing the RS part number, amongst other details), but with that removed, you can access the presets used for calibration. Interestingly, the manual doesn't make reference to these openings - instead instructing you to remove the PCB to reach them. 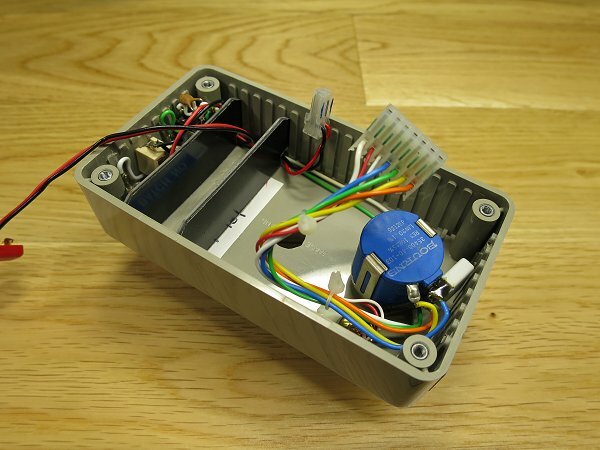 Behind the wiring, you can see the battery meter, held in place with hot-melt glue. It's made by Andersmeter, and is still available today. I note the manufacturer says that the FSD is 500µA rather than 1mA - and a quick test (with a 1030 Microcal!) confirms that to be the case. Looking at the other end, with the battery guides removed we see that the box has needed significant amounts of work to make everything fit. That must be incredibly labour-intensive, to say the least! Turning to the PCB, we see that it contains a 4-pole, 6 way switch, the two multiturn presets for calibration (high quality Bournes types), and a TO220 MOS-FET (BUZ71A) that's had its legs bent to fit into a TO5 footprint. Note the multitude of 0.1% precision resistors, plus a number of "SOT" resistors (within sleeving). The capacitors next to R9 are an afterthought - they are in parallel (100pF each) and connect between the drain of the MOS-FET and the star ground. The gap between the presets is where the 10-turn potentiometer sits - in fact the PCB rests against the rear of it. It's very tightly packed - it must have been quite a design exercise making it all fit in that tiny box - this was before 3D CAD! As you can see, the assembly was dipped in something - it looks like potting compound. I'm not sure why - the usual reason is to protect your IP, but when doing that you would submerge the PCB in a plastic box that becomes a permanent part of the assembly. Here, the coating is so thin that it doesn't obscure anything - you can see the PCB traces when you shine a light through it, and the top of the IC is exposed anyway. Given that I had no problems seeing all the details, I suggest that this provides precisely zero protection against a determined competitor! So, I wonder if this was to protect against environmental factors like humidity? Or leakage caused by handling? The unit is based on the LM10CLN, which is an interesting IC that contains a 200mV voltage reference and a pair of op-amps. 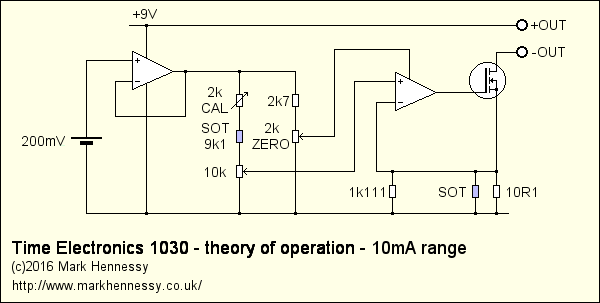 One op-amp is committed to the voltage reference, but the other is free to use as desired. Interestingly, this op-amp uses exactly the same pins as a normal single op-amp in an 8 pin DIL package, and the reference op-amp is available on pins 1 and 8. 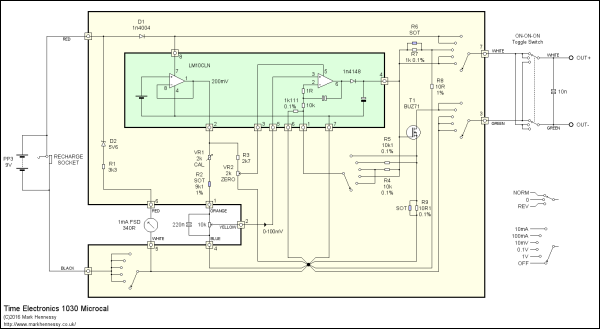 A DC trim input is provided on pin 5 which works on the uncommitted op-amp. 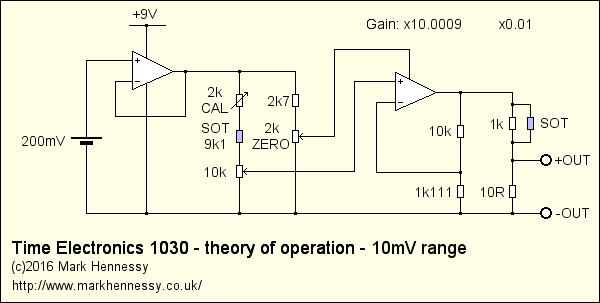 By powering the 1030 from an external source, it is possible to increase the voltage limit on the current ranges to 12 volts. In terms of accuracy, the 200mV is specified to ±5% in the "C" version. Not stella, but you'd expect to use a pre-set to trim the voltage as required. Stability is the important parameter, and here tempco is 30ppm/°C, which is pretty respectable. The tempco for the whole product is specified at 150ppm/°C. 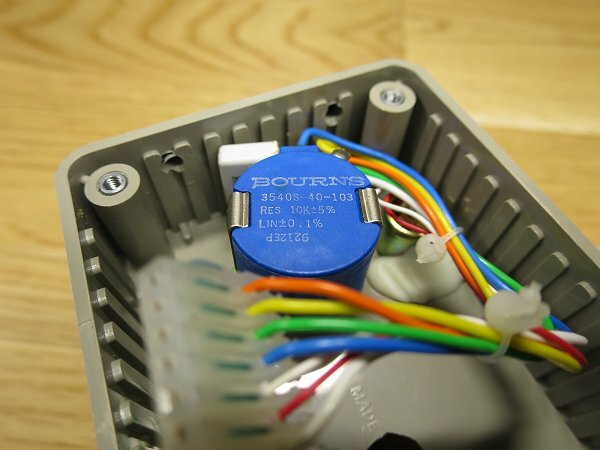 The Bourns potentiometer has a 50ppm/°C tempco and naturally, other components will play their part as well. 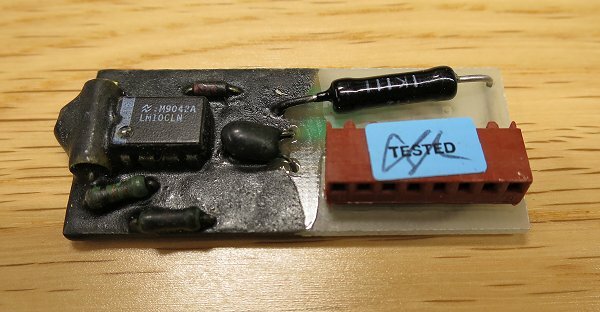 As soon as I saw this IC, I got a sense of déjà vu - it's used in the TBOH02 Self Powered Active Load, which is a nice open-source project that is based on an EDN article (Precision active load operates as low as 2V by Joel Setton, published in August 2005). For a while now, I've been planning my own version of this, but doing away with the self-powered aspect to allow greater precision at lower operating currents. But I digress... 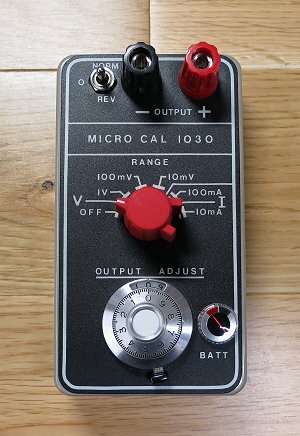 There are many similarities with the 1030 Microcal when in current mode, so it's certainly worth studying the article. The current version of the manual for this product doesn't include a schematic diagram. However, both printed copies that I have in front of me do - though they are both drawn differently. Neither is easy to follow, so I have re-drawn it in a way that makes sense to me, and have also included details of the module. Common to all modes, the reference amplifier is set to unity gain, so simply buffers the 200mV reference. This is passed through to the 10 turn pot via the CAL preset and a SOT resistor (9k1 in my samples). The reference has a tolerance of 5%, as does the potentiometer track, so this control needs to have a reasonable amount of range - hence the choice of a multiturn preset. All this means that the voltage at the top of the potentiometer is 100mV, and as the op-amp section has a gain of x10, the voltage at the output of the second op-amp varies from 0 to 1V. As before, the voltage from the potentiometer varies from 0 to 100mV, but now the op-amp section has a gain of x1, so the voltage at the output of the second op-amp varies from 0 to 100mV. 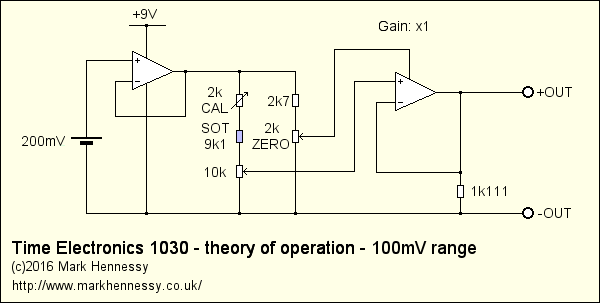 The op-amp gain is back to x10 so the voltage at its output varies from 0 to 1V, but now an attenuator is added to the output of the op-amp. 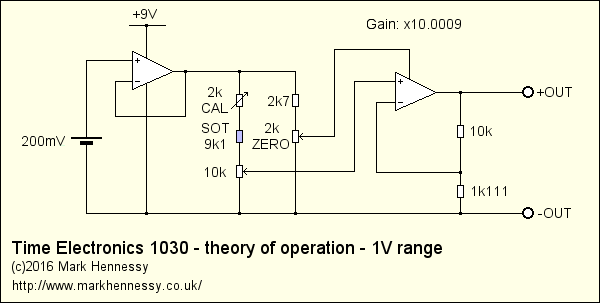 This divides the op-amp output by 100, giving the 0 to 10mV required. Of course, any noise and offsets in the op-amp are also divided by 100, which is good practice - the rise in output impedance to 10Ω is a small price to pay for this. It's worth saying that this potential divider is actually in circuit at all times, whether the output is taken from it or not, and whether the unit is in voltage or current mode. We'll come back to this point later. In the current ranges, a MOS-FET is employed in the classic "textbook" current source configuration. Well, current sink, technically! The second op-amp takes feedback from a shunt resistor that has a voltage across it that is proportional to the current passing in the output terminals. As before, the voltage at the non-inverting input varies from 0 to 100mV, and so the voltage at the inverting input must do the same. But the voltage across the shunt is divided by a factor of 10, which implies the voltage across the shunt can reach 1V. Of course, 1V across a 10Ω resistor equates to a current flow of 100mA. Finally, the 10mA range is achieved by doing away with the potential divider from the shunt, so now the highest voltage developed across the shunt is 100mV, giving a current flow of 10mA. Having understood the previous diagrams, the full schematic should hopefully make sense. The mode switching is neat, and the way I've drawn it should help to make it intuitive. Please click the thumbnail to see the full version. The battery voltage is switched by one pole of the 6 position switch. A 1n4004 series diode provides reverse-polarity protection. At first, I was tempted to replace it with a Schottky type to reduce the voltage loss, but that was before, as discussed above, I noticed the IC was the "L" version (7V absolute maximum supply voltage, in theory!). 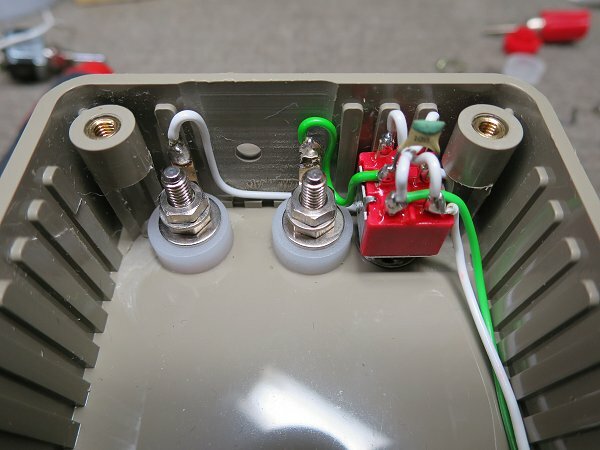 Note the star-earthing to maintain precision - the module has a separate connection for the precision 0.1% 1k111 resistor that is used as divider to get the x10 gain, for example. The signal diode and capacitor at the output of the op-amp is interesting. I'm assuming these are fitted to provide the IC with protection from externally applied voltages and static. There is a time constant formed here, between the capacitor and whatever resistance is presented (a maximum of around 1kΩ from the 10mV potential divider), and this will affect the transient behaviour. My second example was not quite so mint. It looks like the screws were done up too tight at some stage, resulting in 2 of the plastic pillars cracking, losing one of the metal inserts at the same time. There is minor damage to the 10-turn dial, but luckily I have an exact replacement here. Also, a previous owner modified it to run from an external DC PSU. 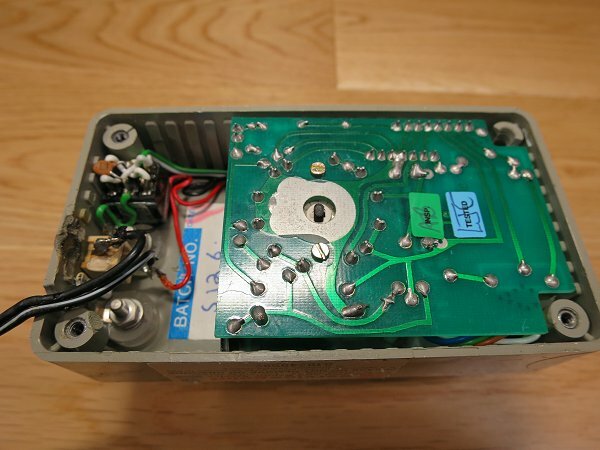 Instead of simply making use of the charging input socket, the lead was soldered directly to the connector, and an opening was filed in the enclosure. As you can see, one of the plastic dividers is also missing - that'll be easy enough to replicate. But the state of the plastic box is the real problem here - just look at those cracked pillars. Knowing that the unit is still in production, I approached Time Electronics with details of my plan to see if they'd sell me a new sticker. However, having seen the pictures of my unit, they sent me a new box, sticker - plus a few other items - for nowhere near enough! Plus, the box was already prepared with the openings and modifications needed to fit the components, so I didn't even need to get the Dremal out. Top marks! The scariest part was applying the new sticker - the glue is very strong, and it was obvious that I'd only get one chance. Looking closely, there were small differences in the position of the holes in the box and the holes in the decal, so I had to decide the best "reference point", which I reckoned would be the toggle switch. If the sticker didn't quite line up with the other holes, that would be hidden by the components, but the toggle switch has the smallest nut covering up the label, so this is the one that had to be right. And how to ensure this? Simply use the shank of a 6.5mm dill bit to line them up! Next, a replacement toggle switch. The original could have been re-used, but some of the wiring between it and the output sockets had been melted, so that would have needed replacing. As one had come in the parcel, it made sense to use it. This, by the way, is an ON-ON-ON part, which answers my earlier questions - yes, Time Electronics are still fitting these, so the output is shorted when set to "off". As far as I can tell, it's an Eledis 1A type. As you can see, I copied the style of the original assembler. It took a lot more time than you might expect, and highlighted to me both the skill of the people who work on production lines, and why hand-built equipment costs what it does. 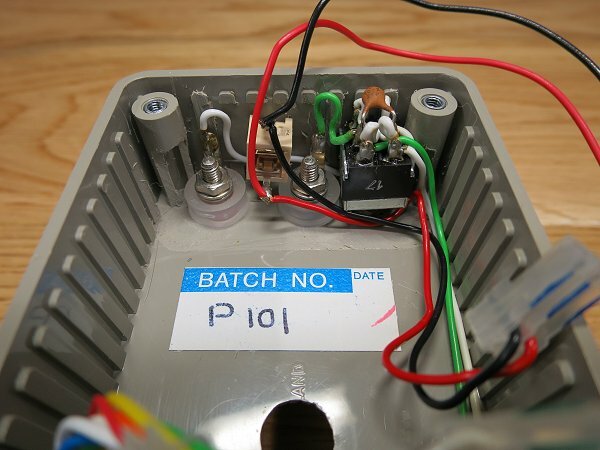 Today, you'd consider mounting a small PCB on the rear of the switch to simplify the wiring, but labour costs have gone up a lot in recent times, and back in the day, such an approach might not have made as much sense as it perhaps might today. Next, I needed to sort out the wiring to the DC input socket. A spare was kindly included, which was good because the original had been melted by the soldering iron of whoever modified it. It's simply a case of joining a new 9V battery snap to the existing red and black wires and the socket - the only detail to watch for is making sure the wires won't get in the way of the panel that divides the battery compartment from the wiring. With those tasks complete, time to build a replacement divider for the battery. I used Paxolin for that, cut to shape on my Bosch mitre saw (which had no problem cutting through it, but the smell lingers for days!). I made 2, as the plastic one I had was a bit of a loose fit, being slightly smaller than the other 2 that I have in my mint example. Final assembly was easy, but when I checked the calibration, I ran into a problem. There are 2 adjustments - Zero and Cal (details in the manual) - but the Zero adjustment wouldn't go low enough. As a result, there was an error on the lower end of the range that progressively improved as you got towards full scale. Checking carefully, there was a 1.3mV DC offset between the two input pins of the op-amp that couldn't be nulled out using the Zero adjustment. I checked what I could in the hope of escaping the inevitable, but it was pretty obvious that the IC was faulty. Fortunately, it's still readily available today, but of course, we have the potting compound to deal with! Fortunately, this cured the problem, and now everything works perfectly. I'm really impressed with these units. The tiny size is fantastic, and I like the operational aspects. I'm also impressed with the circuit design - a circuit that has been well engineered to result in a low component count and a minimum of adjustments. The resulting precision is very welcome. For basic checking of multimeters, these are ideal. But there are other uses - a small source of clean, controllable DC voltage or current is useful when doing R&D work, such as biasing semiconductors or testing moving coil meters or similar things. I haven't had a chance to investigate the dynamic behaviour yet, but a quick test with an LED suggests that you should be cautious when testing them because that time constant at the output of the op-amp causes the LED to flash brightly when it is initially connected. The low output voltage might limit the range of tests you can do on a DVM, but that's not the only use of this by any means. 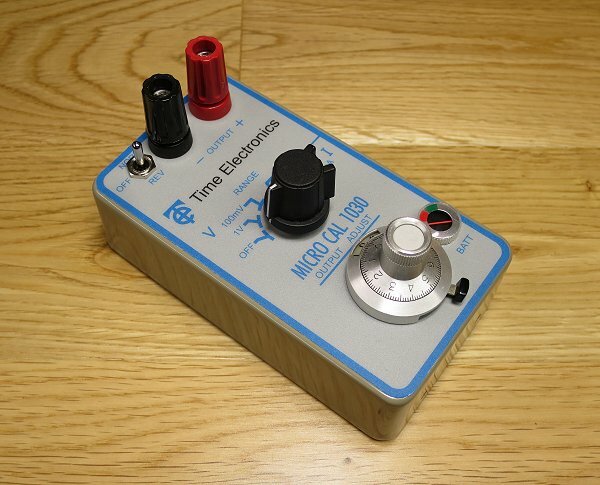 Also, I must praise Time Electronics for their support with my restoration. To be clear, that hasn't changed anything I've said in my review, but excellent designs and excellent customer service don't always go together (I'm looking at you, Fluke and Keithley! ), so it's really nice to learn that Time Electronics are willing and able to stand by their products. In summary, highly recommended. Buy one, and you'll wonder how you managed without!